If you are a food business and you are not on Instagram…then you are a bit of a doughnut. The type that has nothing in the middle. Time to fill that hole with some Nutella and get yourself an Instagram profile. We are in the age of oversharing. Consumers share their location (#Burleighhill), workout (Thanks @kayla_itsines), lunch, latte (check in and tag cafe), their family (link to mum), friends, pets (#cavoodle #furrychild), home (here, have my address), daily schedule (The 6am Yoga class at @yoga is my fave)…the list goes on. Sponsor a post, they’ll share their credit card details too! The topic of personal security and privacy is another topic – for another blog, however this willingness to share experiences can be highly beneficial to businesses. Particularly if there is some food on the table. Instagram is basically a review site now. 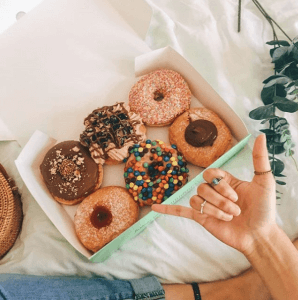 If someone has a bad experience and doesn’t care about the aesthetics of their feed, they may post a meal that was underwhelming.Doughnut Time failed for this reason…their social presence was epic with the tag #doughnuttime getting a great daily workout. Their photos always looked exciting and made people salivate. However unfortunately, the taste didn’t meet the buds expectations and as a result, the business was sold to new owners who immediately shut half the stores. Instagram links to maps and people will trust this is correct when venturing to your place. This will basically help to build a gallery of content without you doing anything…just keep making good food (and being pretty). Having a consistent hashtag will help. Keep it short and simple. Usually the name of your café will do, however feel free to get creative! Hootsuite released a report in March this year saying that the breakdown of men and women is virtually even. Also, 71% of Instagram users around the globe are under the age of 35. Be on top on Direct messages, comments, likes, reshares. Thank people if they post an awesome foodie pic or a selfie in your cute setting. Include menus in your highlights reel, have operational hours available, phone and email contacts…utilise the space. It’s either keep up or bow out. To give you a gauge on how large the Instagram foodie nation is; there are almost 50 million photos tagged #dinner, 1.6 million photos tagged #italianfood, and 800,000 posts tagged #finedining. People want to share their food and their ‘experience’. There we have it – some reasons why it matters to have an Instagram account, especially for food related businesses. Keen to hear where your favourite places to eat are at! Or should we say SEE?